Its summer time guys and everybody are preparing to pack-up their things to go down the beaches of the country. People have set their plans for this month and I made my list too. 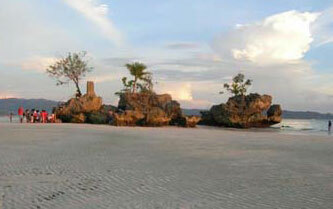 First thing is about my plan in going to Boracay Island this coming weekend. This is actually part of the annual vacation treat from the organization where I am currently working on the day. Because of this, by next week you can’t see any traces of me touching the keyboard of my PC. However, you will definitely see several lovely pictures here from the said paradise island of the Philippines after our few days of relaxation under the sand while lying in the white sands of one of the popular tourist destination of the country. My next activity that is on my list is playing chess in the biggest chess event ever organized by the Capiz Chess Association, Inc. called “Duso… Oras na!” which will commence this coming May 9, 2009. I am not practicing yet and actually don’t know if I could still find time for it. However, despite my unpreparedness I will still play the said 25-minutes chess game. For the information of everyone, the said tournament will be participated by different calibre of chess players from different part of the country. The said chess tourney in Capiz is supported by the Capiz provincial government under Gov. Vic Tanco and the office of Sen. Mar “Mr. Palengke” Roxas sanctioned by the Philippine Chess Federation while CCA, Inc. will organize this event. Now the next on my list are the different search engine optimization (SEO) activities that I will be focusing for the whole summer. SEO projects which is my first priority plus I will give a little as in a small amount of time for some SEO contests. The contest that I am referring to is the “eriuqs spires healthy recreation” and the “sulumits retsambew.” I might give a shot on eriuqs spires healthy recreation contest but I doubt it if I will give more time on the other competition. Currently, my entries for the said SEO contests are on page one after I made the post. I am not doing anything special yet for the said entries because I am prioritizing the official job assigned to me by a client. Well that’s the right thing to do and despite that I am really eager to win the said competitions, I need to give it up for the clients’ sake. How about you, what will you do this Summer 2009? Do you have anything on mind? Don’t hesitate to leave your comments here. hey.. are regular on chess? and blogging and programming? Hey bleuken. How did you end up doing in the chess tournament? Did you have a good time? I’m just curious to hear about the chess matches, as chess has been a passion of mine since I was very young. my plans are to have fun in the sun and do a little seo while relaxing on the beach. i really need to do more than a little seo. @beuken I know that but in Sulumits Retsambew the 1 position entry has been stable for more than 1 month. So it seems Hellas still has the fair chance to win the SEO Contest. Nice to see you clinch the first place in the eriuqs spires healthy recreation . Congratulation for the current 1st position. In sulumits retsambew the contest is much harder as the results now changes each now and then . Best of luck hope you can still make this entry back to top pages. @Cijo, there’s nothing conclusive with the current ranking as in the stability of the positions are really shaky.